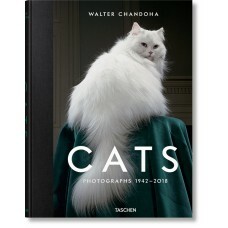 Walter Chandoha (1920–2019) was a combat photographer in the Second World War and an art director postwar, before a chance encounter with a cat led him on a path that would shape his professional career. His images have appeared on over 300 magazine covers and in thousands of advertisements, from posters and T-shirts to the giant 18x60 foot Kodak Colorama in Grand Central Terminal, New York City. Susan Michals is the founder of Los Angeles’s CatCon. She is a former television producer and journalist whose work has been featured in The Wall Street Journal, artnet News, The Observer, and Vanity Fair among others. Reuel Golden is former editor of the British Journal of Photography. His TASCHEN titles include Capitol Records, Mick Rock: The Rise of David Bowie, both London and New York Portrait of a City books, Andy Warhol. Polaroids, The Rolling Stones, Her Majesty, Football in the 1970s, and the National Geographic editions.